Sepetys, Ruta. Between Shades of Gray. 344 p. Philomel Books. 2011. ISBN 978-0-399-25412-3. Can you imagine having your whole family brutally forced to leave your home and taken by train to a forced labor camp? 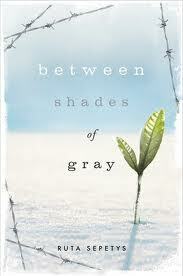 That’s what happened to 15-year-old Lina, in the book Between Shades of Gray by Ruta Sepetys. It’s summer in 1941 in Lithuania. After putting her nightgown on, 15-year-old Lina sits down at her desk to write her cousin a letter. She hears a banging on the front door. It’s not a polite knock, but an urgent and violent banging. Her life is about to change forever.The Soviet Secret Police have given Lina, her mother, and her younger brother 20 minutes to pack some belongings in suitcases to take with them. They are taken by a cramped and filthy train to a forced labor camp and then to another forced labor camp in the Siberian Arctic that has no shelter. Her father has already been sent to to a Soviet concentration camp. What happens over the next decade is unimaginable. Yet, through it all, Lina holds on to hope through her drawings, and a budding relationship with another captive. Between Shades of Gray is a must-read book that tells the very important story of the reign of terror that Joseph Stalin held over Lithuania and other Baltic countries during World War II. This entry was posted in booktalks, historical fiction and tagged historical fiction, Lithuania, Soviet Union, survival, World War II. Bookmark the permalink.